Aladdin and his magic lamp. Sinbad the Sailor. Scheherazade, the brilliant proto-feminist and weaver of tales. These are some of the age-old cultural icons that inventive author Clive Johnson brings to life once again—with a cool modern twist. 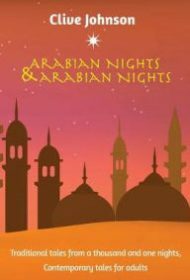 To wit: each of the seven Arabian Nights tales the author reproduces here (in a smooth synthesis of the three standard English translators—Edward Lane, John Payne and Richard Francis Burton) is followed by a new story in which Johnson re-imagines the text for contemporary adult readers. It’s a clever idea, handsomely executed in impeccable prose. “The City of Brass,” a bloody spiritual allegory from the One Thousand and One Nights canon invoking black castles and brass horses, is thus followed by “Via Frances,” in which a philandering minister from Kentucky and his troubled wife seek solace on a religious pilgrimage to Spain. Sinbad’s violent fourth voyage (buried alive in a stinking pit! battle for survival!) takes new form in the harrowing “Baghdad Hilton,” wherein an Iraqi dissident is thrown into Saddam Hussein’s infamous urban prison, beaten and left to subsist on rice and water. “No act of evil that the imagination could conceive would be beyond the wit of the monsters that ran this place,” the prisoner tells us. In perhaps the book’s wittiest coupling, Aladdin and his wooing of the emperor’s daughter is now paired with What Am I Bid?, the tart saga of a grocer’s son from Hong Kong who finds a Ming Dynasty wine cup in a flea market and parlays it into a Mercedes limousine—to win the hand of a real estate magnate’s daughter. Inevitably, Scheherazade also appears, and is deftly transformed in “Stand-Up” into a brilliant, Oxford-educated nightclub comic who manages to enlighten a crude businessman who has mistreated all his wives, albeit not so harshly as Scheherazade’s murderous husband. All in all, this is a delightful collection. So. Seven down, just 994 bedtime stories to go.